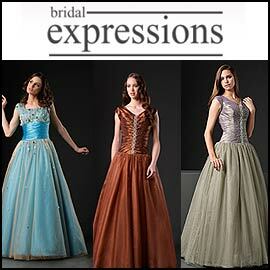 Utah-based Bridal Expressions offers some interesting modest prom dresses that we haven't seen on other sites. The gowns displayed in their photos have cap sleeves, and are presented in an intriguing array of colors, which includes copper, a metallic aqua, a metallic blue and a shiny satin white. The dresses make use of some interesting materials, including organza skirts, beads, sashes and even some large confetti-type embellishments. The website didn't offer a lot of text description of the dresses when we visited, but the company email address and phone number are prominent. Bridal Expressions also carries modest wedding dresses and modest bridesmaid dresses, among other items. You may want to note that the company's website address contains a dash. Thanks for reading Modest Dresses and please consider bookmarking us and visiting again. I really liked your blog on modest wedding dresses. I have been looking for some modest wedding dresses out here in utah for my wedding. Thanks again for your blog its really good.